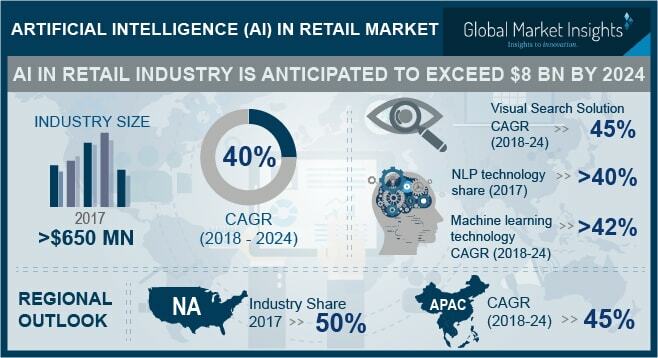 Artificial Intelligence (AI) in Retail Market size is set to exceed USD 8 billion by 2024; according to a new research report by Global Market Insights, Inc. The AI in retail market is driven by the increasing investments in it across the globe. The growing investment in the technology is attributed to the wide applications of the AI technology along with advanced analytics, machine learning. AI is set to unleash the next phase of the digital disruption and the market participants are preparing themselves for it. The investment in the technology is growing rapidly, dominated by the tech giants such as Google, Microsoft, IBM, AWS, and Baidu. In 2016, approximately USD 30 billion investment in the technology has been witnessed, with more than 90% on the R&D activities and remaining 10% on the merger & acquisition activities. Furthermore, private equity financing, seed investment, and venture capital investment also grew significantly amounting to a cumulative total of over USD 6 billion. The technological advancement and the development of the advanced machine learning & deep learning algorithms are also the major driving forces for the AI in retail market. Machine learning is estimated to grow prominently at over 42% CAGR. The growth is driven by the increasing adoption of the technology by the retailers to provide enhanced customer experience and offer a personalized shopping experience to the customers. The visual search solution market is assessed to grow at a CAGR of over 45% during the forecast timeline due to the increasing trend of online shopping and mobile commerce. The solution allows customers to search products using images instead of text or speech. It leverages the image recognition technology to analyze the image and recommend relevant products to improve the shopping experience of the customers. The demand for the solutions is estimated to grow significantly in the future due to the increasing popularity among the online retailers and shoppers. Programmatic advertising is one of the most prominent applications of AI in retail market. As the competition among the retailers is increasing rapidly, companies are looking for new ways to gain customers by implementing advanced advertising strategies. The companies are focusing on “Precision Targeting” to deliver the right messages to the right audience to maximize the sales and reduce the advertising spend. Furthermore, the demand for the programmatic advertising is also driven by the increasing investments by the retailers on digital marketing. APAC AI in retail market is anticipated to grow at a CAGR of over 45% during the forecast period. The growth of the market is attributed to the growing investments in AI technology and increasing digitalization in the region. China is leading the investments and accounting for 17% of the global external investments in AI. Increasing investments by Chinese players also drive the AI in retail market growth in the region. For instance, Baidu has invested more than USD 1.5 billion in the AI research in the past two years, in addition to the USD 200 million investment by the company for the development of a new R&D facility. Some of the prominent vendors of the AI in retail market are AWS, Baidu, BloomReach., CognitiveScale., Google, Inbenta Technologies, Intel, Interactions, Lexalytics., Microsoft, NEXT IT., Nvidia, Oracle, RetailNext, Salesforce.com., SAP, Sentient Technologies, and Visenze.